Plantar fasciitis night splints are designed to provide relief from heel pain caused by plantar fasciitis. The design of the brace is to support your foot and ankle at night, preventing your foot from pointing downward. There are two types of plantar fasciitis night splints: Anterior Dorsal Splints, Posterior Boot Splints. We’ll look at the differences in this article. The idea behind plantar fasciitis night splints or braces is that you can apply a longer stretch to the plantar fascia while you sleep. Study #1: Plantar fasciitis: a prospective randomized clinical trial of the tension night splint. Study #2 Mechanical treatment of plantar fasciitis. A prospective study. Interpretation: If it comes down to paying $200 for custom orthotics or using a $25 night splint, you might have similar results with the cheaper night splint. There are many studies that show night splints to be very helpful in decreasing symptoms of plantar fasciitis. Some studies were mixed or didn’t show significant differences with the use of night splints. The bottom line: night splints may decrease symptoms and help relieve heel pain when used in combination with stretches, exercises and other treatments. What are the Best Night Splints for Plantar Fasciitis? Anterior refers to the front of the foot or leg. The term dorsal or dorsum is another way of describing the anterior (front) part of your foot and shin. The design of these dorsal splints place the supportive brace along the front of the foot and shin. The Cramer Dorsal splint is an example of this style. The key benefit of this style splint is that is is more comfortable for some people, allowing the heel to breath. Some reviews also note this style of brace does not get as hot as the ‘boot style’ brace described below. The term posterior refers to the back of the foot or leg. On the posterior boot splint, the supportive structures are located along the back of the ankle and heel of your foot, preventing your foot from pointing downward at night. The design of this brace is effective, but it generally is described as a little more bulky as it can feel like you’re wearing shoes or boots to bed. There have not been any conclusive studies to determine if dorsal splints are better than boot splints. The biggest difference appears to be in the comfort levels while wearing the brace. If you absolutely cannot stand when your feet get hot at night, you probably won’t like the boot splint. If you don’t like the idea of a supportive brace along the top of your foot, avoid the dorsal splint. The Mars Wellness brand of plantar fasciitis night splints come in various sizes: S, M, L. Designed with padded straps and buckles, these braces ensure immobilization of the foot to ensure an effective stretch. Dual tension straps allow for increased dorsiflexion, giving an overall improved foot angle for an optimum stretch. These braces are lightweight and low profile and are made of a sturdy but breathable material that provides treatment while you wear the brace. The open toe feature is designed to keep your feet cool and dry. 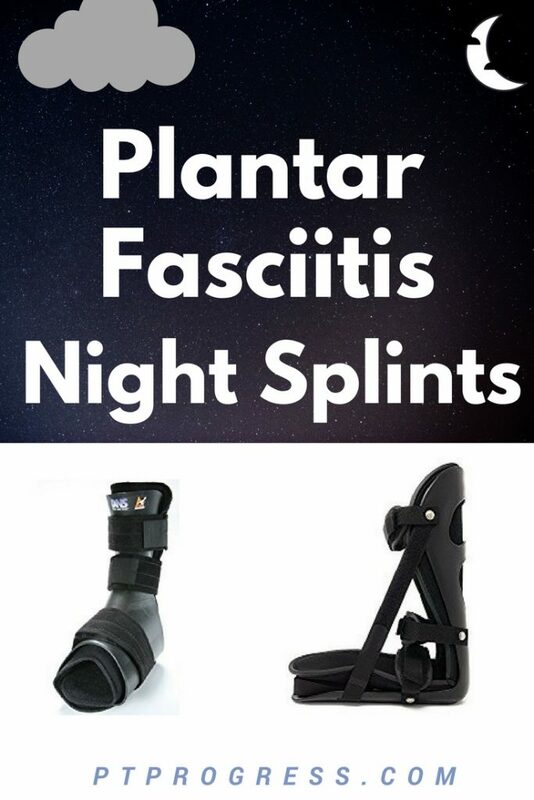 This night splint is a little more unique as it provides an anterior dorsal clamshell support that holds the foot in a neutral position throughout the night. The purpose of this is to support the arch and to promote healing of the fascia through pressure relief. The design of this splint places the hard backing brace on the anterior (front) aspect of your foot, which is also called the dorsum of your foot. Many reviewers of this style of splint enjoy the extra mobility it allows without compromising the stretch it provides to the foot. Less bulky than the traditional posterior night splint, this splint is reported to be more comfortable and has less heat retention than typical night splint boots. The Futuro night splint is designed with a low-profile support, soft breathable straps and cushioned edges for a comfortable fit. In reading the reviews for this brace, it wasn’t difficult to find cases where people experienced relief in as little as one week after wearing the brace. This reflects the consistent research that shows the short-term effectiveness of wearing a night brace. Some of the negative reviews were based on the durability of the foot brace. This seems like a challenge because durability on a soft brace that is worn night after night may be compromised with extended use. The Alphabrace is a low profile night splint that uses 3 velcro straps to position the foot into a dorsiflexed position to maximize a stretch to the calf and plantar fascia. Similar to other braces, the top reviews on this brace reported decreased morning heel pain after a few nights of wearing the brace. Others commented on the affordability of the brace as this currently can be purchased for less than $20. The negative reviews were similar to other braces, stating how the brace can feel awkward and bulky at night. Regardless of the night splint, it will probably feel like you’re wearing snow boots to bed, so finding a night splint with good padding and supports may help you get through the night. The Vive soft night splint is a soft, boot style splint that also includes a foot massage ball with purchase. The key benefits of this splint are the removable and adjustable foam stretch wedges that allow you to customize the intensity of the stretch that you feel. The entire splint is padded with a soft lining and is removable so you can wash the covering. Positive reviews are similar to other night splints, reporting relief in as little as the next morning, but full results after a few weeks of wearing the brace. This brace appears to have the most positive reviews regarding the comfortability of the splint, which matter if you’re not getting sleep due to the bulkiness of a brace! Conclusion: Should I Use a Night Splint? As a Physical Therapist, I’ve recommended night splints to my patients who are looking for an additional means to treat their painful feet. My personal opinion is that active stretches and exercises in combination with proper footwear and supportive orthotics can really help someone beat plantar fasciitis. I hope you find relief with your feet and found this review of night splints to be helpful!